On October 9 SafeTGA hosted a meeting for bicyclists and neighbors to discuss the closure of Kingshighway, the City’s plans for cycling on Tower Grove Avenue, and alternative options. The eighteen attendees included residents from the Shaw, Tower Grove South, and Southwest Garden neighborhoods, as well as parents of City Garden Montessori students. Present also were the Executive Director of the Missouri Bicycle & Pedestrian Federation and 24th Ward Alderman Scott Ogilvie. 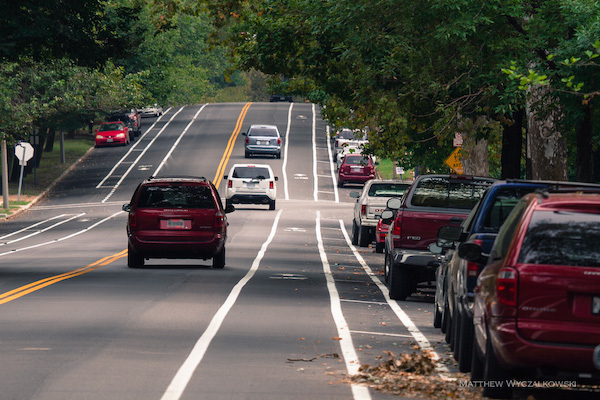 Following the presentation and an informative debate, the attendees unanimously voted their preference that buffered bike lanes be installed on Tower Grove Avenue before Kingshighway closes, as specified in the Bike St. Louis Phase III plan. The City proposal was widely seen as inappropriate and unsafe, and the attendees agreed that keeping Tower Grove Avenue unchanged is better than the City plan. 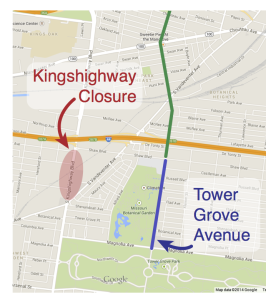 You can download the full presentation here, get more details about the Kingshighway closure and background on Tower Grove Avenue here, and sign a petition to share your thoughts. Below we present the city proposal and three alternatives, each with a discussion of their pros and cons based on feedback voiced at the meeting. Update: KMOV TV recently ran a story about this issue and our petition – see and watch it here. 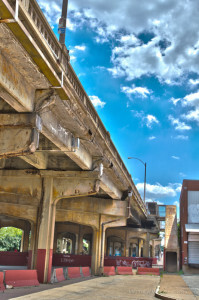 Starting in early 2015 Kingshighway will close between Shaw and Vandeventer for a year and a half as an aging bridge over railroad tracks is rebuilt. This arterial road carries 45,000 vehicles per day, and traffic on nearby roads is expected to increase as a result. The primary detours will be along Vandeventer, Shaw, and McRee, which will be reconfigured to accommodate more traffic. Still, the concern is that excess traffic will spill over into other streets, particularly during rush hour. To address this, the City aims to increase traffic capacity along Tower Grove Avenue between Magnolia and Shaw (blue segment on map below) during peak hours by prohibiting parking and allowing two lanes of traffic. The South Kingshighway Viaduct between Vandeventer and Shaw is in poor shape and will be rebuilt starting early 2015, closing Kingshghway for 18 months or so. The closure of Kingshighway will require traffic to find alternate routes. The City aims to increase traffic capacity during rush hour along the half-mile stretch of Tower Grove Avenue marked in blue. The rest of Tower Grove Avenue (green) will remain single lane in each direction. Attendees questioned both the assumptions as well as the prescriptions driving the City proposal for Tower Grove Avenue. It is not clear that traffic needs to increase significantly along Tower Grove Avenue, since it is well removed from the principal detour and serves mostly local residents. 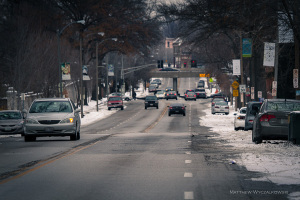 Increasing capacity on Tower Grove Avenue will lead to higher traffic, faster speeds, and more congestion and noise – a “little Kingshighway” that the residents do not want. Yet Tower Grove Avenue will remain single lane outside of this section, requiring its two lanes of traffic to funnel down into one, causing more congestion than if it remained a single lane throughout. 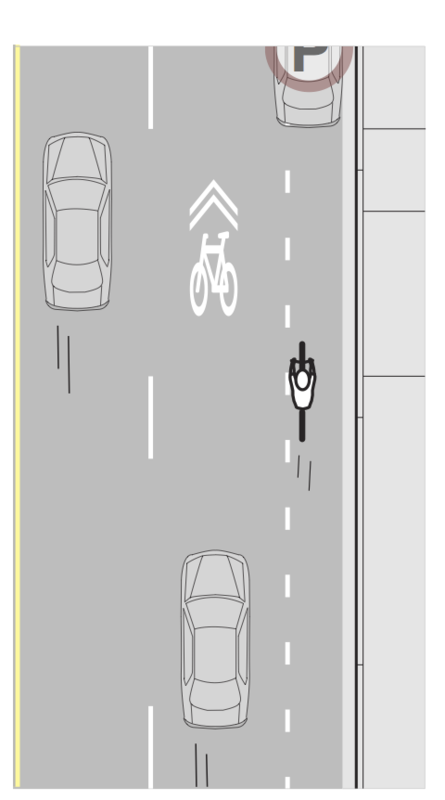 The City’s proposal, which can be seen here, calls for a “bikeable shoulder” to be painted five feet away from the curb (illustrations below are our best interpretation of the proposal). During rush hours parking will be prohibited and riders will use this shoulder as a bike lane. Outside of rush hour, cars will park against the curb and cyclists will share the lane with traffic, as currently indicated by existing sharrows. Typical configuration. 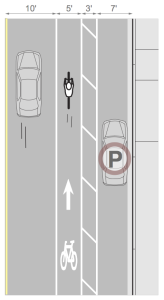 Outside of rush hour, the proposed configuration is similar to the current one, with cars parking against curb and cyclists sharing right lane with traffic. Hazards for cyclists. A dangerous situation arises when few cars are parked and cars travel in the right lane. A rider in the “bikeable shoulder” is forced to quickly merge into unsuspecting traffic. While the City’s proposal is inexpensive and represents minimal change for drivers, in our discussion it was widely seen as confusing and unsafe. 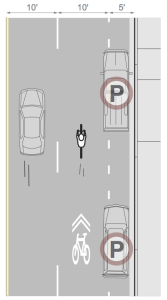 As an example, when there are just a few parked cars (right after rush hour, for instance) many cyclists will be guided to the painted “bikeable shoulder”. Drivers will expect cyclists to ride there as well. 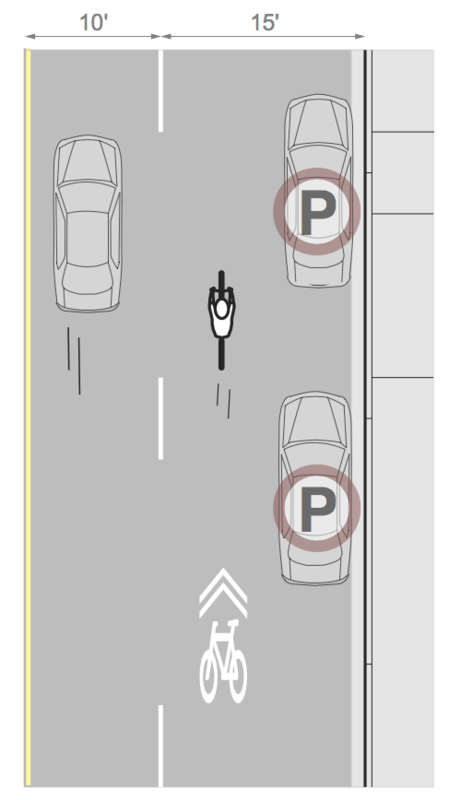 When coming upon a parked car, though, the rider will have to quickly enter the travel lane. This is intimidating and dangerous for cyclists as well as for drivers, who will be surprised to have a bicycle suddenly appear in front of them just as the lane narrows. 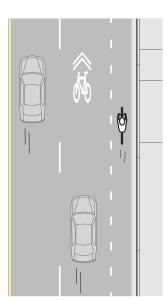 Alternatively, cyclists may choose to ride where the sharrows (shared lane markings) are, regardless of parked cars. This is the safer and more predictable option, but leaves the rider vulnerable to aggressive drivers who may even try to pass on the right. The main task of bike lanes is to provide consistent guidance for all users of the road, so that cyclists know where to best position themselves, and drivers know where to expect bicycles. The City proposal provides no such service. It is confusing and open to interpretation, and is thus more dangerous than no bike lanes at all. The simplest alternative is to make no changes to the existing configuration of Tower Grove Avenue. This is illustrated below. Current Configuration The right lane serves as a combined parking, bicycle, and occasional driving lane. Current Configuration With parked cars the right lane is too narrow to drive in and serves as a de facto bike lane. Cyclist Hazards Safety concerns are similar to the City proposal. Sharrows provide minimal – but not contradictory – guidance about appropriate rider position. Presuming that the same parking restrictions will be enforced as in the City proposal, this option has many of the same drawbacks as that plan. 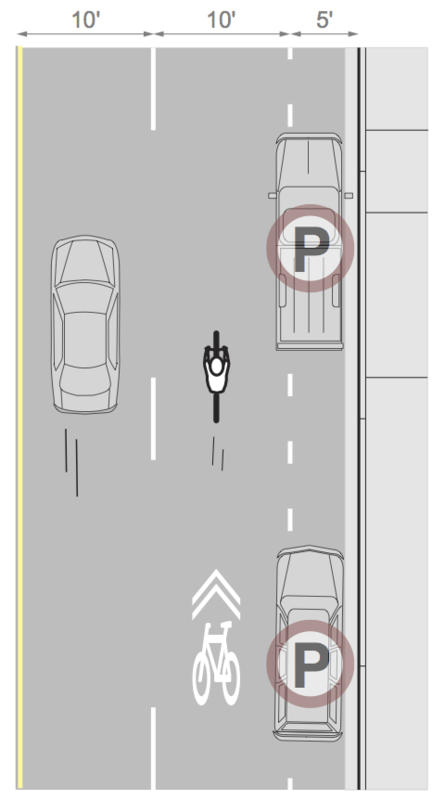 Intermittent parking forces riders to either merge quickly into traffic or makes them control a very wide lane. 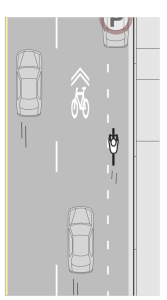 Sharrows, meanwhile, provide minimal guidance about where a cyclist should be positioned. Still, minimal guidance is preferred over conflicting markings which confuse both riders and drivers. While doing nothing is a poor solution to the problem of cyclist safety, it was seen as a preferred alternative to the City proposal. 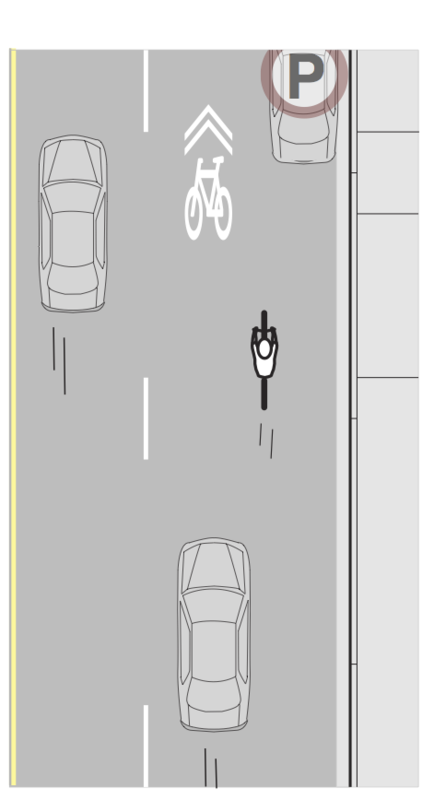 The buffered bike lane properly positions cyclists away from parked cars and has been implemented elsewhere in St. Louis, including on Arsenal Street nearby. 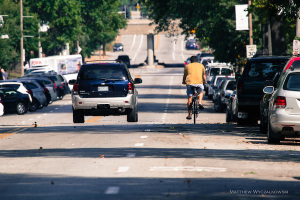 It is the treatment prescribed for Tower Grove Avenue in the Bike St. Louis Phase III program, and the City has committed to implementing buffered bike lanes once the Kingshighway project is complete. 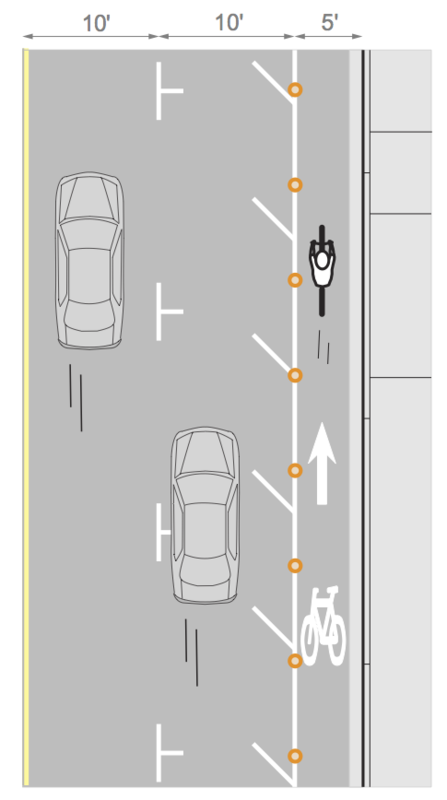 In addition to providing cyclists with a consistent space to ride, buffered bike lanes calm traffic by reducing the effective width of the roadway. Buffered bike lanes.Buffered bike lanes provide clear and consistent guidance for bicyclists and drivers. 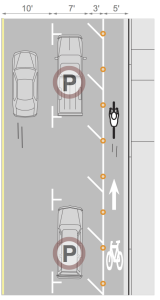 The “buffer” strips between the bike lane and parked cars keep cyclists out of the door zone. Buffered bike lanes on Arsenal Street. Buffered bike lanes have been implemented elsewhere in St. Louis. They are planned for Tower Grove Avenue as part of Bike St. Louis Phase III but are delayed because of the Kingshighway project. Hazards. One problem with buffered lanes occurs when aggressive drivers try to crowd a cyclist or pass on the right, particularly during times of heavy traffic and few parked cars. The absence of cross traffic on this section of Tower Grove Avenue makes bike lanes relatively simple and safe, and the buffered bike lanes installed a year ago on Arsenal have been quite well received. One potential problem again occurs when there are few parked cars, as confused or aggressive drivers may try to drive in the bike lane or even pass a cyclist on the right. 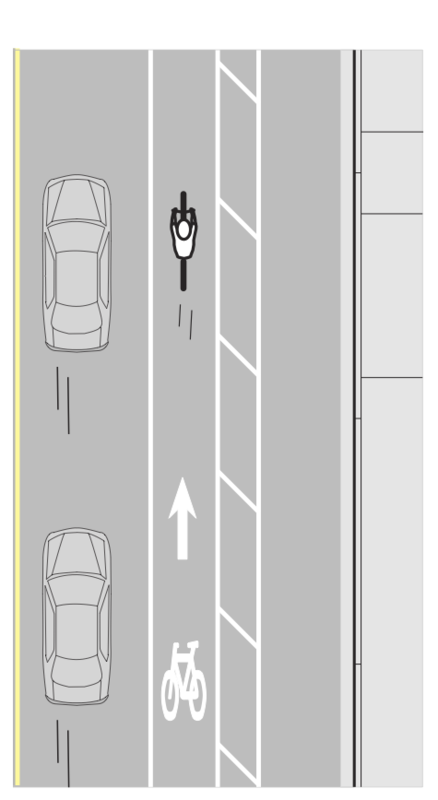 Still, there is no ambiguity about proper positioning of cyclists, and right lane driving may be addressed through enforcement or physical barriers. 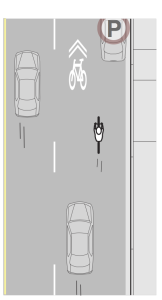 The buffered bike lane was the unanimous favorite proposal, as we’ll describe below. 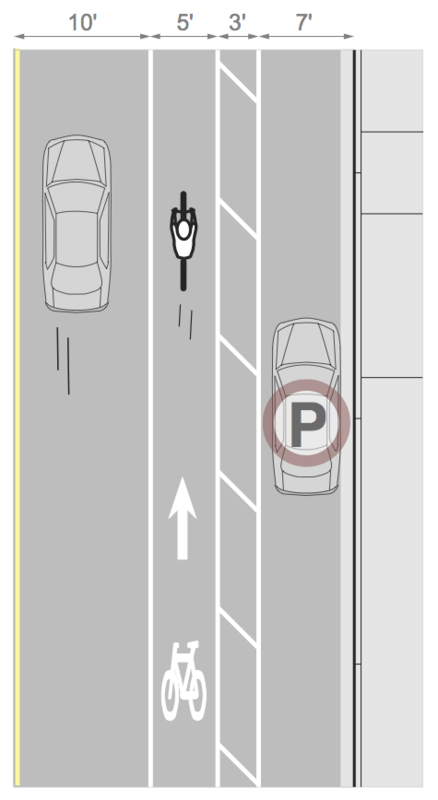 A final proposal is the parking-protected bike lane, which features a permanent bike lane against the curb. The left lane is a full-time driving lane, while the middle lane can be used either for parking or driving, depending on roadway needs. 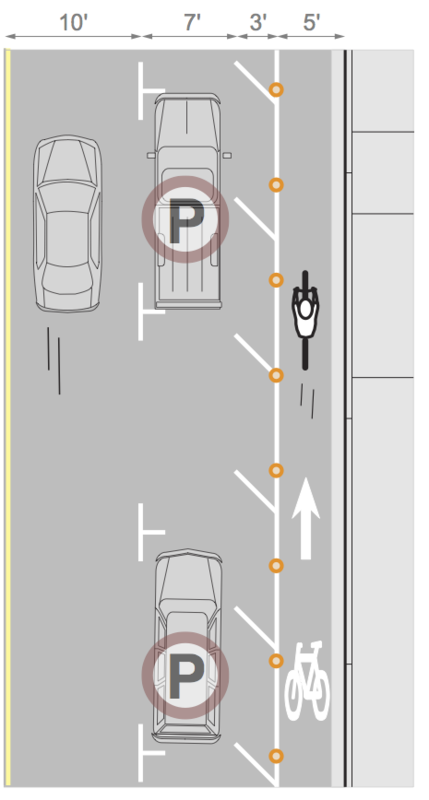 To prevent cars from parking in the bike lane, plastic bollards will typically be placed to the left of the bike lane. Rush hour configuration During times of peak traffic cars drive in the middle lane, where parking is prohibited. The bike lane is not affected by changes in parking. Maintenance concerns. A photo of snow accumulated on Tower Grove Avenue in the winter. Protected bike lanes (not pictured) will require additional maintenance as cyclists have no easy way to bypass the leaves and snow which will collect there. 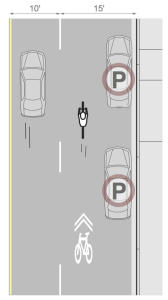 A major advantage of this configuration is that bikes have a permanent lane while parking is reconfigured to accommodate more traffic, with parked cars providing an added layer of protection for cyclists during off-peak hours. 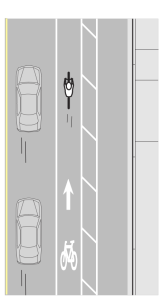 Such lanes have not yet been implemented in St. Louis, and would require an adjustment for both cyclists and drivers. A more serious concern is the maintenance of the lanes. There are many mature trees along this stretch whose leaves will accumulate in the protected lanes, and in the winter snowplows may damage the bollards. The roadway is in poor shape against the curb and drainage there is poor. All in all, maintaining safe and usable protected bike lanes would require a significant and sustained commitment from the City and/or the Missouri Botanical Gardens. The eighteen attendees represented a diverse spectrum of age, interests, and skill levels. Not all were cyclists, and not all were advocates of increased bike infrastructure. Nevertheless, a broad consensus emerged. First, safety issues along Tower Grove Avenue are a concern to everyone, including drivers as well as parents of children who attend the City Garden school. Increased traffic, congestion, and noise are seen as a threat to the quality of life in the neighborhood: “Don’t turn Tower Grove Avenue into Kingshighway,” one of the attendees remarked. Finally, the plan to increase capacity by adding an extra lane during rush hour was seen as neither necessary nor helpful. At the end of the meeting a show of hands was called to ask what the attendees wanted to see happen. All eighteen voted that buffered bike lanes be installed before Kingshighway closes and that the full and prompt implementation of the Bike St. Louis Phase III is important. The City’s proposal is unsafe and should not be implemented. What you can do. If a safe and rideable Tower Grove Avenue is important to you, please sign our petition. Please also share your thoughts with Alderman Conway (314-622-3287), Mayor Slay (314-622-3201), the Streets Department (314-647-3111), and your alderman (more details here). Excellent summary of our options and the pros and cons of each. 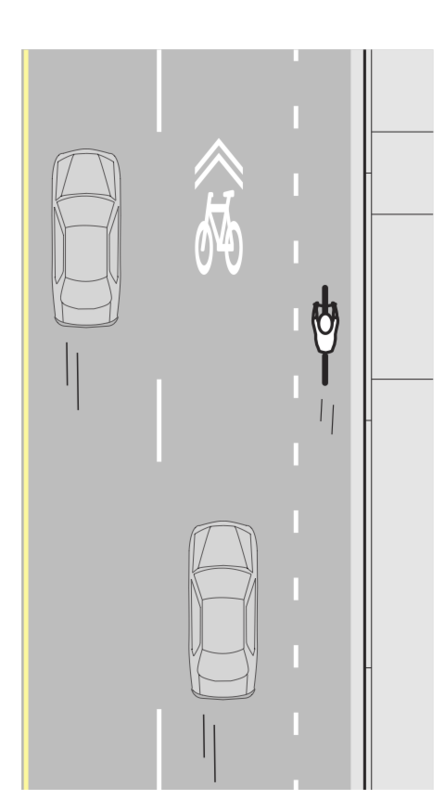 Buffered bike lanes, as proposed in the Bike St. Louis Phase III plan, absolutely seem the best way to go, especially from the perspectives of clarity and safety, impact on neighborhood, and overall cost. Thanks for doing this work to help make us all safe! I bike and drive this section of Tower Grove Ave regularly and consider both the perspectives of motorists and cyclists’ safety. I appreciate the St Louis City commitment to implement “buffered bike lanes once the Kingshighway project is complete” according to the Bike St. Louis Phase III program. However, I agree with the residents who suggest bike lanes should be painted before the Kingshighway closure for the following reasons: A bikeable shoulder does not guarantee safety for anyone and causes more problems as clearly depicted in the above scenarios where a bike must merge quickly into unsuspecting traffic due to parked cars and other road hazards such as snow, trash, broken glass or other debris. I also agree one lane of vehicular traffic in each direction is plenty on this short section of Tower Grove Ave which could see more crashes and grid lock bottlenecks at each end point where 2 lanes would merge back into one lane. Therefore it is in the best interest of cars and trucks to maintain one smooth flowing lane with a clearly marked dedicated bike lane during the Kingshighway construction. 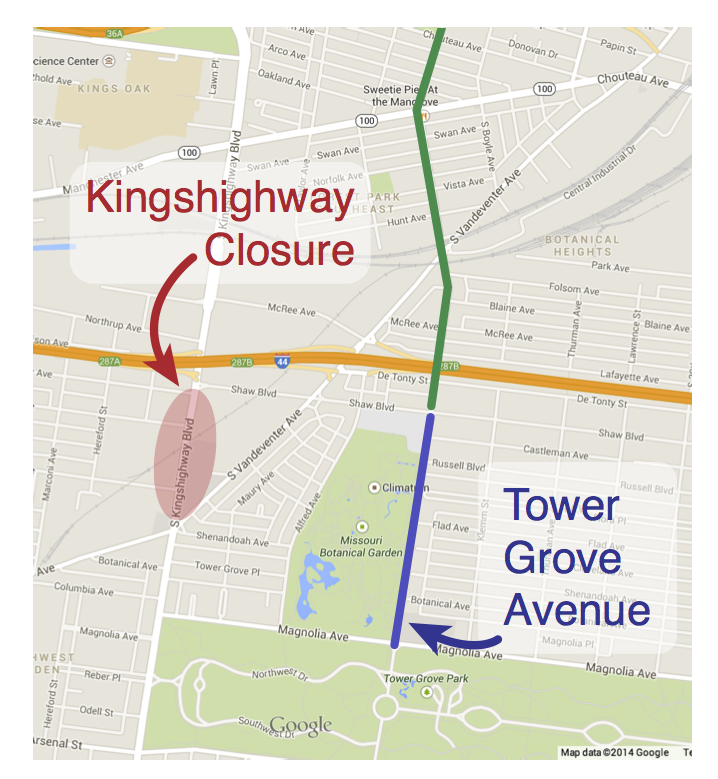 The Kingshighway closure could be the impetus for many more commuters to choose cycling and/or public transportation on Tower Grove Ave. I’d also like to hear opinions from Metro bus drivers and riders on this topic. I am a Shaw resident and bike and drive this section of Tower Grove Ave regularly and consider both the perspectives of motorists and cyclists’ safety. We don’t want to see anyone injured or killed! It’s vital to implement buffered bike lanes on Tower Grove NOW, not later according to the Bike St. Louis Phase III program. I agree with my neighbors who suggest bike lanes should be painted NOW before the Kingshighway closure: As a cyclist, I know that bikeable shoulders do not guarantee safety and causes more problems as clearly depicted in the above scenarios where a bike must merge quickly into unsuspecting traffic due to parked cars and other road hazards such as snow, trash, broken glass or other debris. I also agree one lane of vehicular traffic in each direction is plenty on this short section of Tower Grove Ave which could see more accidents and grid lock bottlenecks at each end point where 2 lanes would merge back into one lane. Therefore it is in the best interest of cars and trucks to maintain one smooth flowing lane with a clearly marked dedicated bike lane during the Kingshighway construction. The Kingshighway closure could be the impetus for many more commuters to choose cycling and/or public transportation on Tower Grove Ave. This summer we bicycled in Boston and New York City (Manhattan and Brooklyn!) and these cities are way ahead of St. Louis in bicycle infrastructure, ensuring safety of cars and cyclists. I hope we can mover forward on safety NOW! Couldn’t cars be rerouted on Vandeventer instead of Tower Grove to preserve the popular Tower Grove bike route. Agree that planned bike infrastructure improvements should go ahead sooner rather than later. If cars are rerouted on Tower Grove where can the cyclists go (safely). 2 Pings/Trackbacks for "SafeTGA Meeting: A Report"